With Union Budget 2018-19 just around the corner, the Indian real estate market waits with bated breath to see how it can potentially benefit. In fact, it has never been a better time for aspiring homebuyers, as there is a more than generous stock of ready-to-move housing options across most Indian cities. Ready properties are the pièce de résistance of 2018, not least of all because they are the most de-risked purchase proposition, do not attract GST and offer instant gratification. After all, owning a house is the culmination of almost every Indian’s lifetime efforts and aspirations. The sense of security, achievement and social stature linked to home ownership is what has for long been driving the demand for – and supply of – residential developments across India. All major roads, railway stations and airports are flanked by hoarding advertising real estate projects. With a massive urbanization rate of more than 30% (estimated to reach 40% by 2030), the demand for homes in India an assured long-term story in which chapters will continue to unfold. However, due to wavering economic growth, an uncertain job market and rising property prices, residential real estate demand has remained largely subdued over the last few years. Paradoxically, developers continued their protracted project launch spree – leading to a huge unsold inventory pile-up. Due to the structural changes and policy reforms such as demonetization, RERA and GST, the new launch activity slowed down in 2017. Nevertheless, December 2017 saw more than 7 lakh units remaining unsold across top 7 cities of India. Under the RERA regime, stringent guidelines and financial discipline have now been force-fed into the systems and processes governing the real estate business in India. Unsurprisingly, developers are now focusing on completing existing projects to avoid being entrapped in compliance hassles. This laser focus on project completion is a blessing for homebuyers. The mammoth unsold inventory has already turned the Indian real estate arena into a strongly buyer-favouring market. Now, at the beginning of 2018, there is a huge opportunity to cherry-pick ready-to-move-in house as around 1.7 lakh unsold units are likely to get completed in this year. With the right kind of boosts to the Indian consumption story, we could see a massive return of buyers who are hoping to snap up ready-to-move homes but need that last decisive ‘last-mile’ incentive push. 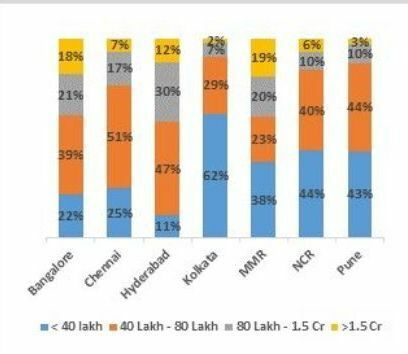 The above graph confirms that a large chunk (67%) of unsold inventory to be completed in 2018 will be added in NCR, MMR and Bangalore. 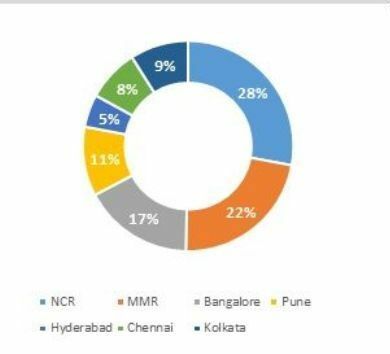 Over the past few years, NCR – largely an investor-driven market – has been a front-runner among the top 7 cities in terms of churning out new residential launches. However, developers’ focus on completions has been minimal. Now, the entire new launch activity seems to have shifted to a slow track due to the combined effect of demonetization, RERA and GST. Among NCR’s many developers, those that had been relying on deceit and misinformation are now having a rough time as the real estate business as a whole re-orients itself to the rebooted market conditions where the focus on project execution has become a paramount consideration. MMR’s real estate market is driven by a good mix of investors and end-users and has also been flooded with new launches over the past few years. While the many structural changes and policy reforms in the recent past have taken the sheen off the high-end and luxury real estate segment, mid-range and affordable housing projects will remain in focus in MMR for the foreseeable future. With massive growth potential and huge latent demand in the suburbs and peripheral areas, housing requirements in these regions will make a comeback sooner than in other parts of the city. Bangalore, largely an end-user driven market, has always adjusted as per market guiding circumstances and developers have accordingly restricted new launches to align with realistic absorption potential in such a market. This time around too, Bangalore’s developers are concentrating on completing existing projects rather than adding new ones to the market. In terms of affordability, buyers scouting for ready-to-move-in homes priced below INR 80 lakh will have a bracing spread of options across the top 7 cities. The major disruptive structural changes and policy reforms are now behind us. As 2018 begins on the right note of transparency and the right approach by developers, ready-to-move-in homes are indeed the flavour of the season. If Union Budget 2018-19 takes the right direction for the Great Indian Middle-Class, the sales uptick of these properties could be very significant indeed.